As you can see from the pictures the designs printed onto the covers are simple and clean. I particularly enjoy that they hearken back to the Oklahoma state song with a few words from the song with simple images. The wheat stalk on orange is particularly nice. The light blue with a windmill is also a nice touch. 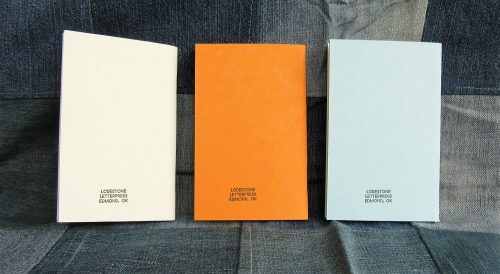 Fans of Field Notes will recognize the 3 shades as the classic butcher colors of paper used in the original colors of Field Notes. The cover stock is sturdy and feels great. The combination of spare text, simplified imagery, and card covers is very nice. The back cover sports a simple company label. 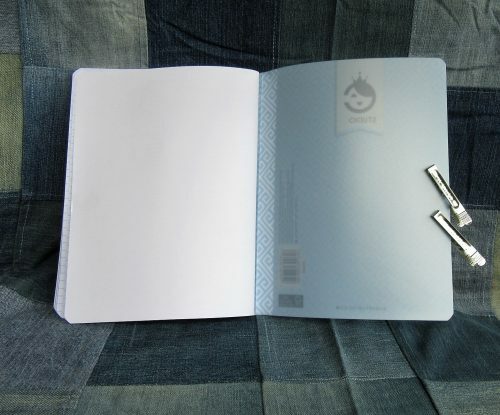 Inside the sturdy covers are 48 unruled pages of white drawing paper. I’ve tested it out with pens, pencils, watercolor, brush pens, and light watercolor washes. With the wetter applications of watercolor the paper cockled a tad, but overall the paper responds well to everything. My wettest M nibs showed some signs of soak through but most FP inks did okay, with show through here and there, but not so much as to make the verso unusable. Mostly I really liked this toothy paper with pencils and brush pens. I responded the best to these tools. The whole thing is held together with 2 sturdy silver staples. The corners are square. I’ve been carting mine around as a general sketchbook for the last few weeks and It’s very sturdy and capable. 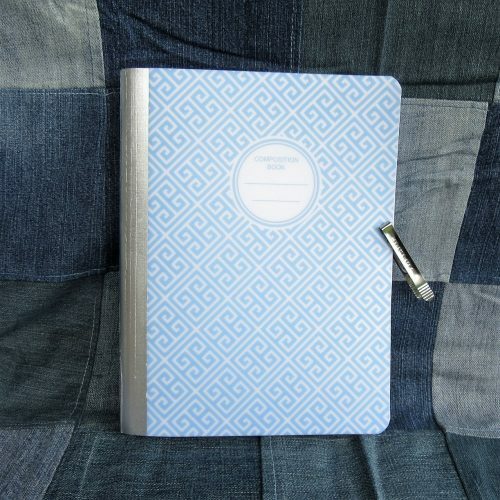 I like it and Spencer deserves some support for his cute sturdy notebooks. 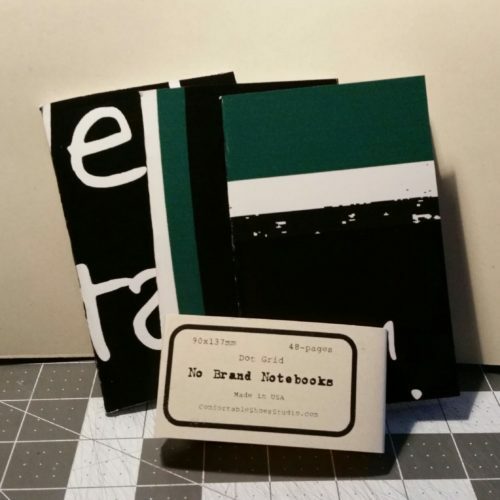 This entry was posted in Review and tagged letterpress, lodestone, notebooks, pocket notebooks on 20170831 by leslie. My last post was incomplete. I’d only been able to get books at Target and Staples. This week I went to two of the three the local Walmarts. 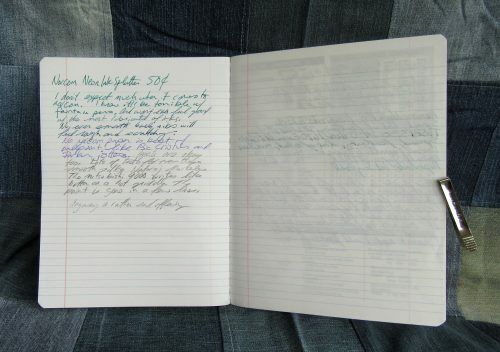 One had not one composition book and was a wreck. The other Walmart was also a wreck but they had composition books. All are standard size (9.75X7.5 inches or 247x190mm) and college ruled. The so called “fashion covers” feature patterns in white and some fashion color. In the case of these there were light teal, salmon pink, and a few other colors. These were also available in awful tacky metallic animal prints. UGH. These were the least offensive of the “fashion” covers. I chose teal and white. The cover is printed onto thin cardstock. It is not quite as floppy as a poly cover but almost. 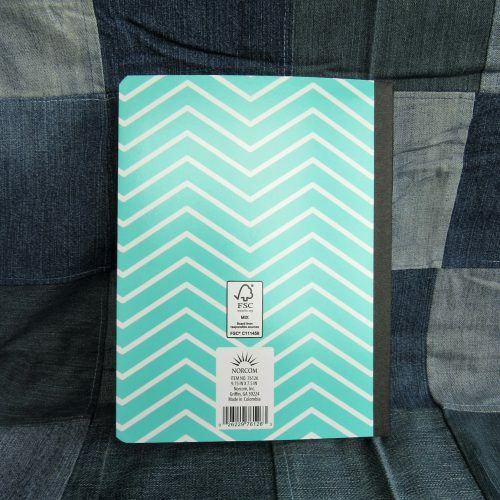 The card is sturdy enough that the notebook might survive a semester in a backpack but I doubt a whole school year. There is a rather thin strip of textured paper tape on the spine. The width of the tape is proportionally off. It looks wrong. The front cover has a label area, which I greatly appreciate. It is pretty generic looking. Good job on that Norcom, you nailed what a comp book label SHOULD look like. Inside the 100 sheets have light blue ruling that disappears quite well. The paper is nicely smooth but has enough tooth to be great for pencil. Ballpoint, rollerball, and gel ink all did great too. 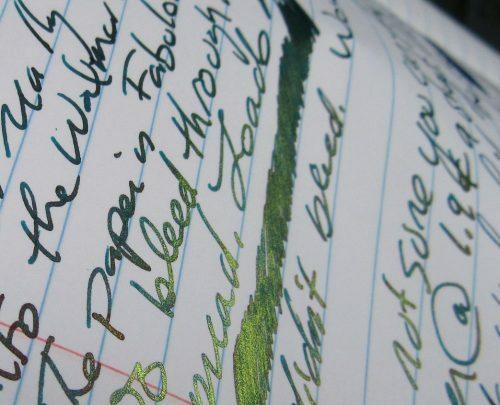 Fountain pens feel great on the page but spread and feathered all over. Even fine nibs bled through. If this didn’t do so well with pencil I’d say avoid it at all cost. Why try another Mead 5Star when the one from Target was good? Well first this one is $1.97 and the copyright date is different. The Target version is 2016 while Walmart’s was 3013. Does it matter? Yeah. The cover is the same as in the last entry. Thicker and stiffer than most of the other poly covers in the race. The stitching is well done. Repeat the last entry. Until you get to the paper. It is slightly more absorbent and you don’t get the super sheen with fountain pens. I also had some bleed through that I didn’t have with the Target 5Star. The price is better but you’ll have to dig through the boxes to find some from 2016. I checked but found none, all at this Walmart were from 2013. They were great for pencil and the rest of the pens. Well, except for the firehouse of a Papermate InkJoy I tested. That had issues with bleed through where the letters crossed themselves. This is the first Pen+Gear* product that I can tell you to avoid. 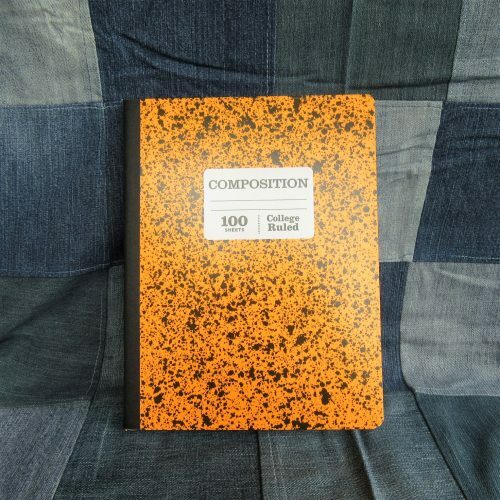 Get their made in India pencils and index cards but avoid this composition notebook at all cost. Why? Let’s start with the cover. Yes it is poly, the thinnest floppiest poly I’ve yet to pick up. The textured fabric tape on the spine is far too narrow completely throwing off the look of the book. Normally I’d be super pleased that they actually used real fabric tape instead of textured paper, but not when a wider application of paper tape would look right but also do the job of protecting the area where the spine will flex properly. Further the spine is poorly stitched. It is not centered on the spine but folded oddly. 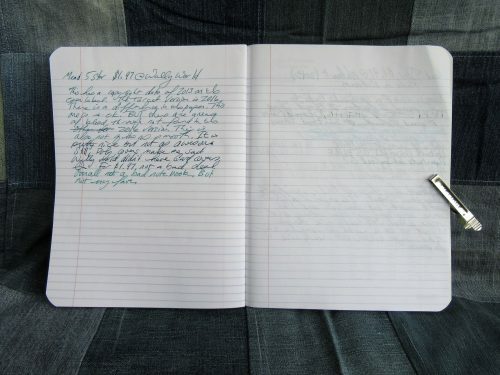 The top half of the notebook has wider pages than the second half. 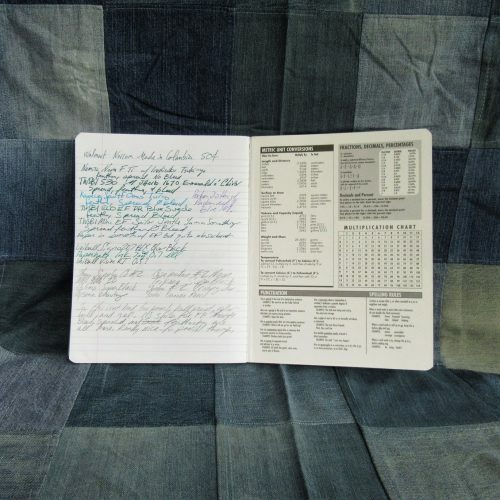 Inside there is an odd 80 count of sheets with bright blue ruling. It’s bright and thick and will never recede into the background. 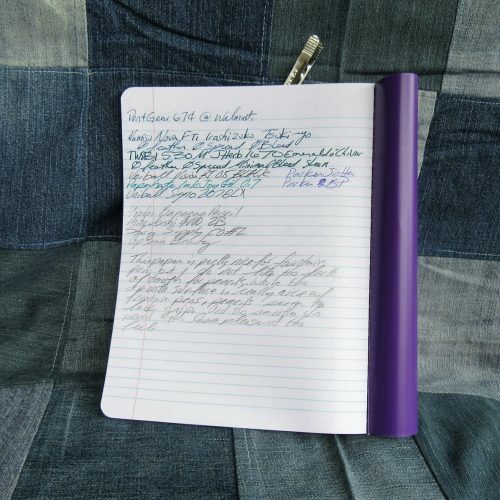 The paper is crisp and holds up well to fine fountain pens. Wider nibs tend to bleed but feel great on the page. Ballpoint, rollerball and gel all do okay. Pencils slip and slide. The paper lacks tooth. I had to really work hard to get graphite onto this paper. The label doesn’t peel off easily. It left a sticky mess. I really disliked the Pen+Gear offering. It’s not good enough with fountain pens to justify buying for that purpose and it is just so terrible with pencil that it goes into my do not buy list. The paper in this is essentially the same as the previous Norcom offering. The cover, other than a different “fashion print” this one straight outta 1988 with neon ink splattering, is the same as well. It sports the same too narrow textured paper tape and thin card cover. Norcom has another meh offering. It’s not bad at 50 cents- especially for fine or ef fountain pens, and pencil. 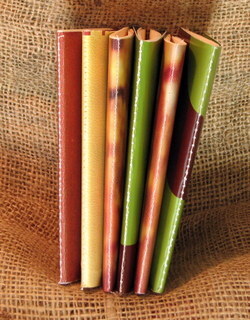 This entry sports a poly cover printed with a variety of patterns in a variety of colors. I picked out dusty blue in squared swirls. The classic front cover label is circular. The poly cover is as thick as the Mead 5Star cover but lacks the interior printing. The spine is taped with metallic textured paper tape. The width of the tape is generous and looks appropriate on the cover. 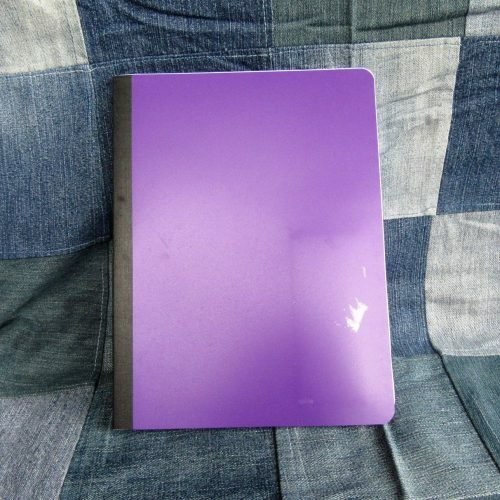 The poly cover is translucent and to protect your work inside, they have placed a plain sheet of white paper with the traditional school info printed on the inside. It is a nice touch. 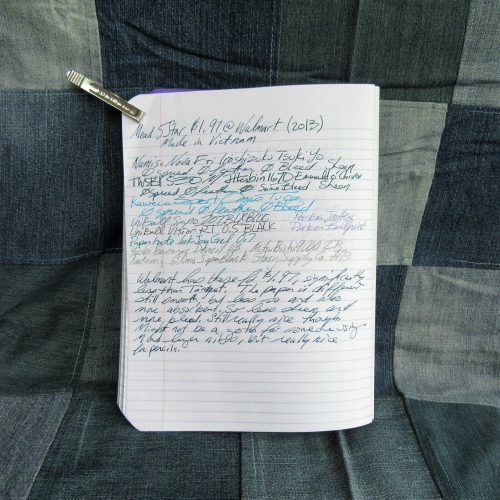 The ruling is bright blue and disappears behind most of the sample writing I did.The paper doesn’t feel particularly smooth, until you run a fountain pen across its surface. Then the pen dances and slides in the most wonderful way. Even better, there was no spreading, no feathering, no bleed through and loads and loads of wonderful sheen. This notebook performed as well as the Mead card covered from Target. My inks all look amazing on it. Also, pencil feels wonderful. There is enough tooth that the pencil slides perfectly and looks nicely dark. I didn’t have to work to get the graphite on the page. The Studio C was a very pleasant surprise given how disappointing I was with the rest of the Walmart offerings. It’s not the greatest value, at 1.9 cents per sheet it’s in the middle of the road of expense. The Target Mead card covered is still a better value at about 1.2 cents a sheet. 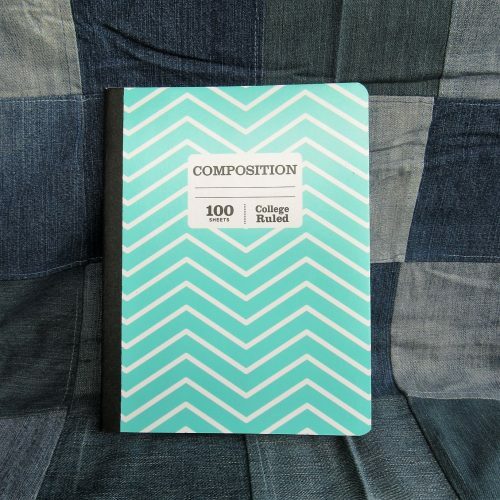 But the price difference is negligible when you compare the 100 to 70 sheet offered in each notebook. 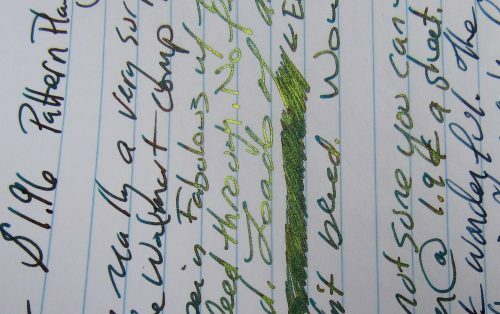 If you don’t write with fountain pens and you stay in the realm of gel, ballpoint, rollerball, and pencil the Norcom have fun covers, and some ugly stuff too. 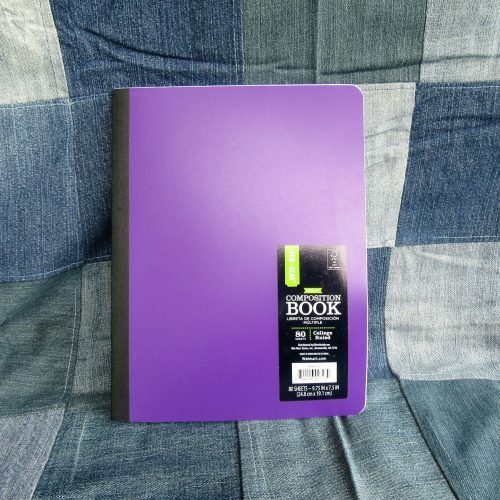 At 50 cents a notebook it is a good value. 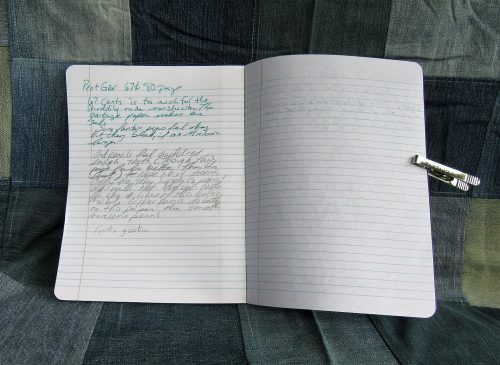 I have to say, avoid the Pen+Gear notebook at all cost. The paper is terrible, binding shoddy, and poly cover flimsy and floppy. It is garbage. This entry was posted in Review and tagged composition, notebooks on 20170727 by leslie. 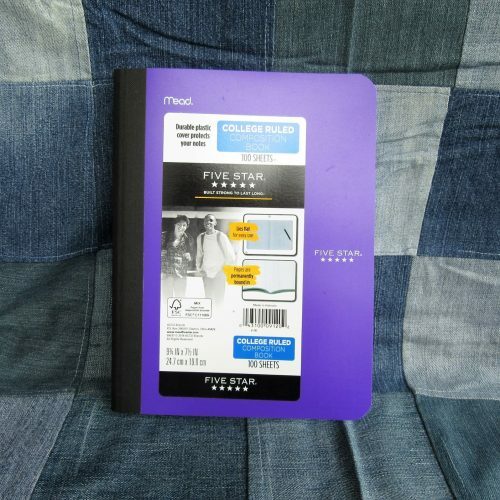 I intended for this post to come out BEFORE I introduced No Brand Notebooks, but alas I left it in draft form and forgot about it. That said, I’m a huge fan of open sourcing information and I’ve offered up patterns for a bunch of my products to others for free in the past. 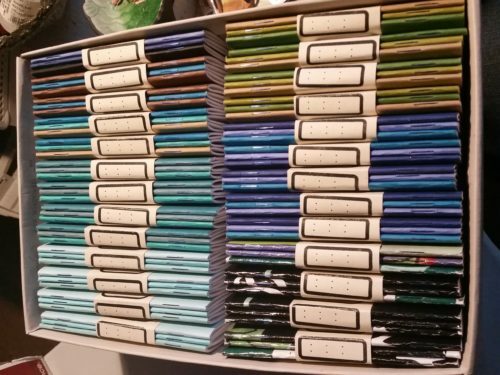 I’ve done tutorials on many of the books I’ve sold in the past, and frankly, I think being open about the process of binding brings more people into the hobby than being closed about info. Sharing is caring and all that fun stuff. I’m a maker not a great salesperson. Also, before anyone asks, no I will not make diagrams or take photos of the process. The images provided should give you a good idea of where staples should be placed. Experiment and you’ll figure it out. 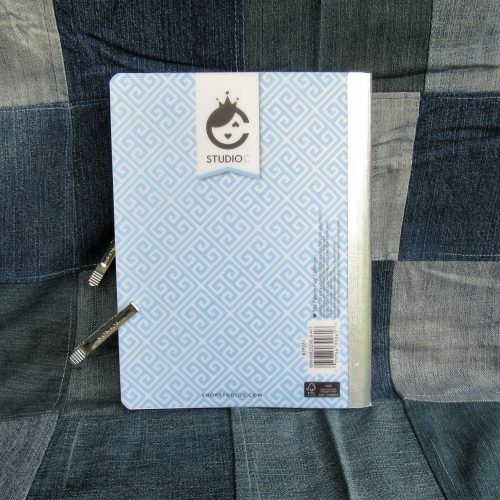 Any of you who have read this blog for any period of time know that my obsession with stationery started young, but was really pushed to new heights as I attempted to find a sketchbook that worked for me. 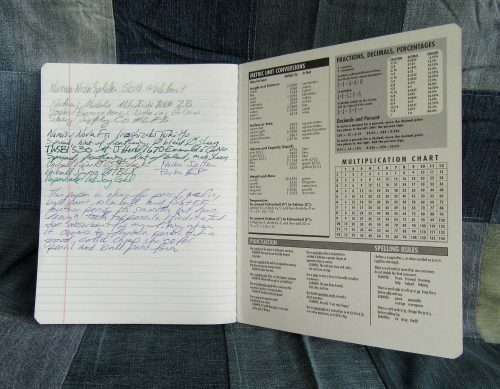 As a young artist I tried sketchbook after sketchbook, flirted with altered books, used loose paper bound by rivets or contained within handmade binders. 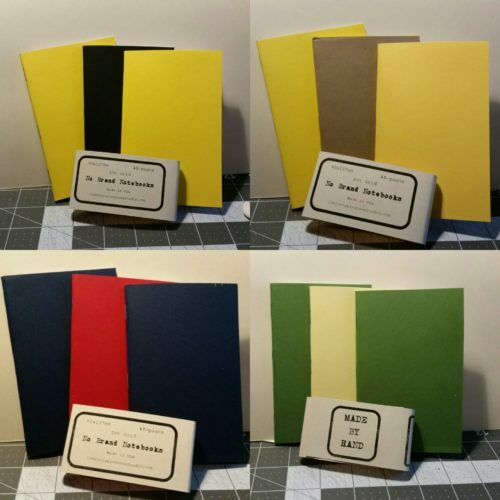 In short I used every paper I could get my hands on, destroying bindings, scrapping books with bad paper, until finally I said, “Screw it!” and started to make my own sketchbooks. 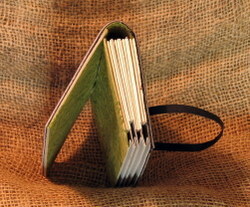 Simple single signature notebooks made of junk paper from work were bound one after another after another. I acquired book after book after book on binding books. I graduated from simple single signature books with limp covers to complex hardcover tomes sewn onto cords, and intricate coptic stitches. 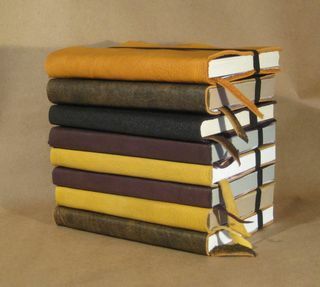 Leather was soon added to my arsenal, and I made thousands of books filled with paper for writing, art journaling, sketching and all kinds of art making. Those were the days. The thing is, binding books is as much an obsession as any other hobby and I miss it dearly. 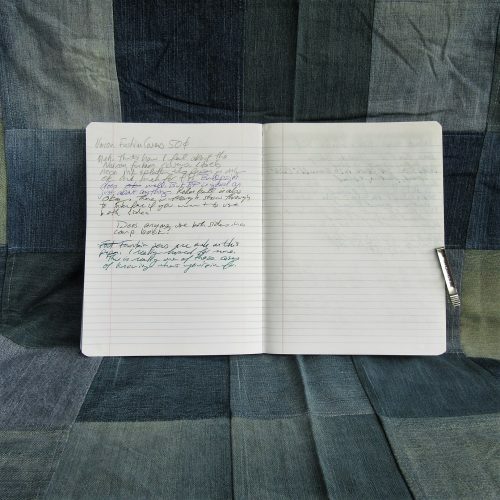 I miss the gathering of sheets, folding of signatures, punching of stations, the smell of beeswax as I pass linen thread through the block of wax. The feel of the stiff waxed thread as it passes through paper and card. These days I don’t get to feed the sensory bit of binding, but I have started to make my own pocket notebooks and Traveler’s notebook refills. It’s dead simple, and you can do it too. Since I’m a fan of open source, feel free to share this info or just use it yourself. First, start off by loading 12 sheets of your favorite paper into your printer. Head to gridzzly.com and play around with the settings. 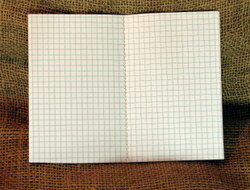 I like lines and dot grids for my notebooks. I like dot grid at 5mm and lines at 7mm. Why? Dunno, those settings work for me. I also move the slider to about ¾ of the way to the right for darkness. The lines will not come out as a true black but more of shades of gray. Test out the site and see what you like. Start with mine and go from there. For my notebooks I work the printer setting to print without margins on any side. The printer can’t flood print, so I get a .25mm border with no printing no matter what I do. I deal with it. Print the lines/grids you like on both sides of the 12 sheet of paper. Stack your 12 sheets of paper and add a piece of cardstock as a cover. Use paperclips or binder clips to hold everything in place. If you are making pocket notebooks set the guide on your long arm stapler to 4.25 inches or 11cm. Starting from the center of the paper, place a staple at 4.25 inches, another at 6, another at 8, another at 9.75, now return to the other side and place a staple at 2.5, and one at .5 inches. You will have a total of 6 staples. Cut the stack in half at the 5.5 inch mark, now fold the half along the staples, letting them guide your fold. Use a bone folder or butter knife to tighten this fold. Using a straight edge, trim the fore edge of the book at 3.5 inches. I have successfully used a rotary cutter as well as a craft knife so long as I’m slow and careful. Round corners if you so desire. Placing the books under weight for a night or two will help keep the spines creased. Several large textbooks serve the purpose well, while a board with a brick or two will also work. An entire ream of paper printed with dot grid, paired with covers, stapled and folded, ready for the shear. #maker 82 books, 27 packs. 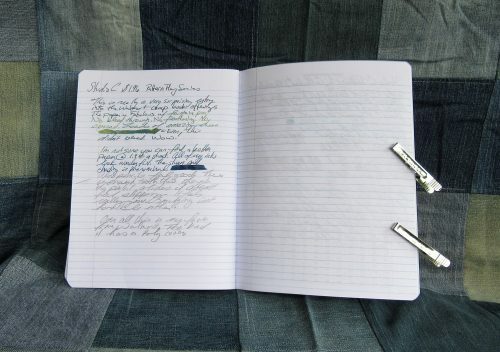 If you are making a Traveler’s notebook, you will place 3 staples, one in the center of the book and one at each end, .5 inch away from the edge. 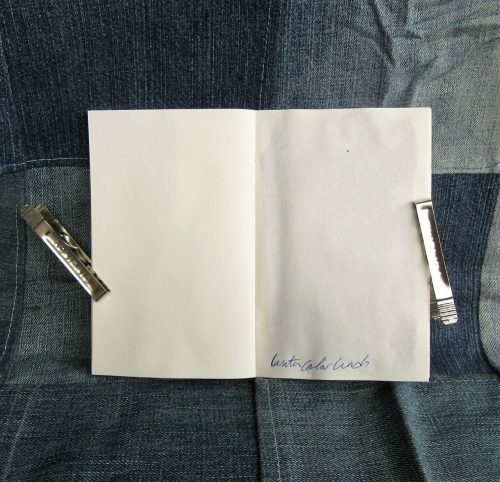 Fold the notebook along the staples, letting them guide your fold. 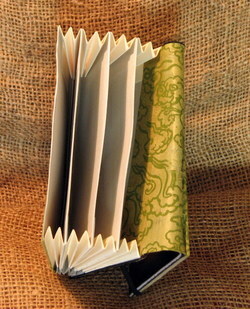 Use a bone folder or butter knife to tighten this fold. Trim the fore edge at 4.5 inches. Round corners if you’d like, then place under weight for a night. I do not trim the excess off the height of my TN, the proper height is 8.25 inches. 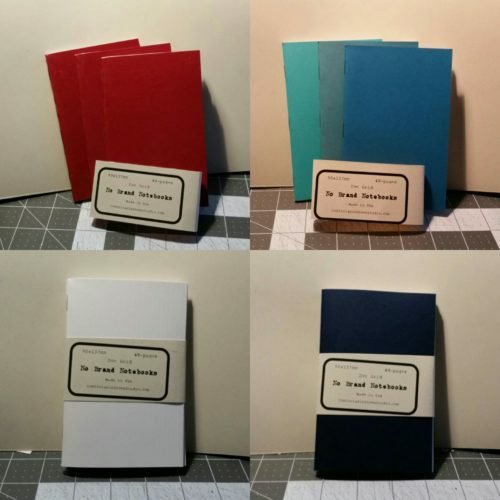 It is ridiculously easy to make your own notebooks with a minimum of investment. A long reach stapler is now only $11 on Amazon, while years ago they cost well over $30. If you keep an eye on thrift stores you can find them for less. Often offices toss them out when the person who did the office booklets quits or retires. I kick myself for turning down an old school cast off of a booklet stapler. Oh how I regret that choice. 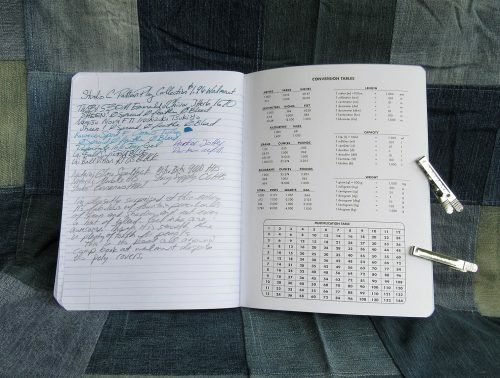 The investment for making notebooks is minor, but the reward is well worth the effort. 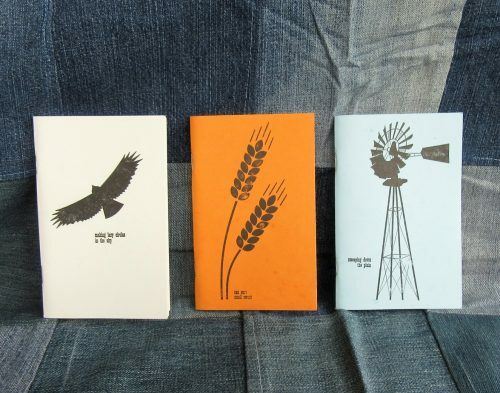 If you make some notebooks I’d love to see them. Hit me up on instagram with pics. This entry was posted in Inspiration, technique and tagged how-to, notebooks, pocket on 20170323 by leslie. were human and doodled in the back of the classroom. door, offering in hand parents looked on, hoping the teachers would be appeased. The relief on their faces as the doors shut was visible. covered in recycled/ upcycled sign vinyl. The sweetest gift I ever got was a dusty candle holder in the shape of a watering can,iInside a dusty candle with faded scent. I spent a lot of time working one on one with that kid, helping him with math and reading as well as his speech therapy. At the end of the year he came in with a well wrapped gift for the lead teacher of the classroom and shyly sat at his desk laboring over a gift tag for the candle holder. He then waited until my back was turned and left the candle holder on my desk. Later that day I was talking to his speech therapist who had been talking to his mother that monring. According to the mother the kid had thrown a temper tantrum that morning because she'd gotten an end of yeaer gift for the lead teach but not for me. He woudln't leave the house that AM. He grabbed the candle holder and asked his Mom if he could give it to me. Hearing that story had been one of those moment wher I felt like I'd reached a kid. It also made it incredibly hard when I got the pink slip a few days later. 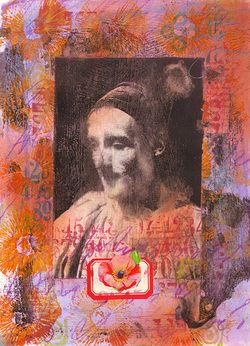 This entry was posted in Uncategorized and tagged art, draw, gift, gifts, journal, notebooks, sketchbook, unique on 20090807 by leslie. is full. It’s too late for a custom order but that’s a thought for next year. 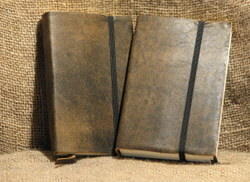 hedgehog notebooks. 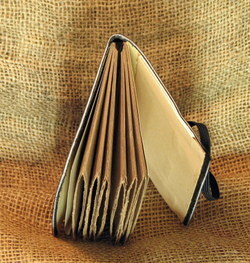 A hedgehog notebook is a handmade version of the moleskine. 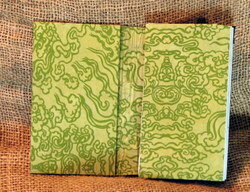 unique one of a kind binding. It’s on sale $25 off. Check it out here. and buy handmade this holiday season. 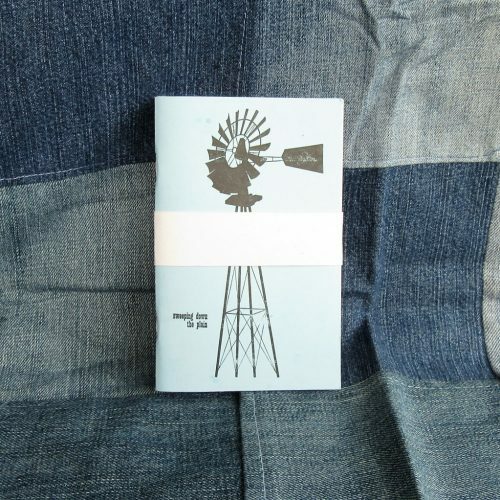 This entry was posted in Uncategorized and tagged art, craft, gifts, handbound, handmade, journal, notebooks, sketchbook on 20071209 by leslie. 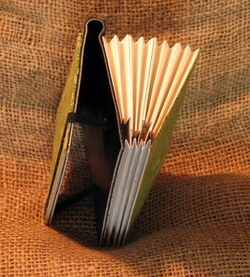 Lynne Perrella is the author of Artists’ Journals & Sketchbooks a neat book about journaling. 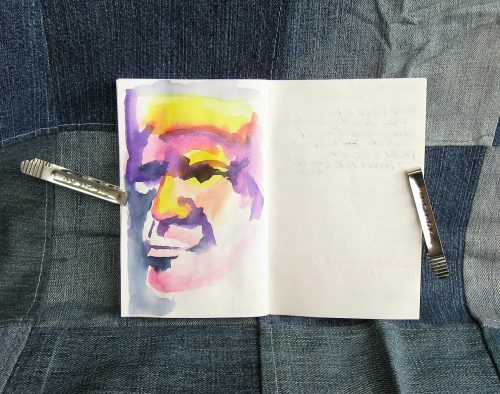 Her website has a neat page of images from her art journals. Check it out! The above images are property of Lynne Perrella. 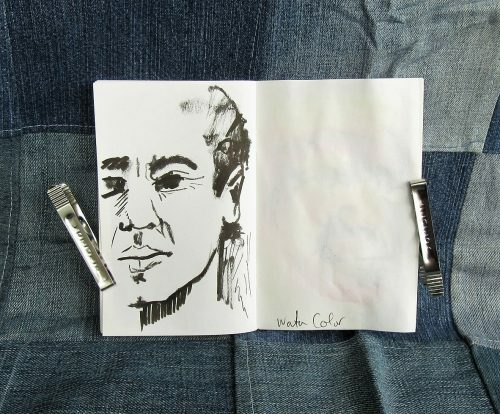 This entry was posted in Uncategorized and tagged art, journal, lynneperrella, notebooks, sketchbook on 20071129 by leslie. Based on a recent discussion thread on the HedgehogsForever group I decided to try my hand at making a hedgehog with expanding pockets inside instead of pages. It went reasonably well. 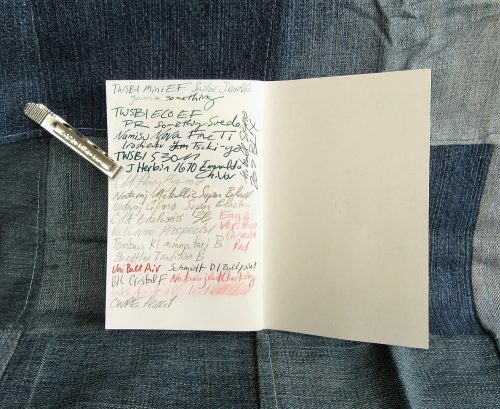 The experiment with the expanding pocket notebook was to see how hard and how long it would take me to make one. The results are cool but they take forever and are complex to make as well. There are a lot of steps one could foul up. And of course the one I made is good, but I fouled up in 2 spots- first I trimmed the cover too small and secondly I made the pockets a smidge too small for what I wanted to do with it- keep my jotters in it in my bag. I forgot to add ¼ inch to the dimensions to make it work correctly. I used stiff cowhide for the cover, backed it with my favorite paper of all time- a green Japanese paper with a screen print of clouds. I love it. 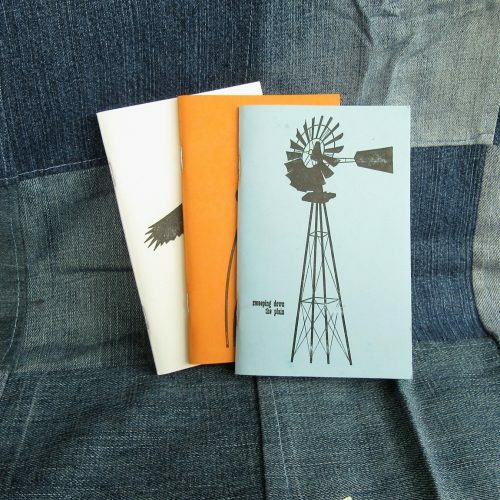 I used cardstock for the pockets, folded and scored them to open out to a pocket ½ in wide. It worked well. From the outside the pockets look just like a regular hedgehog. I made the pocket 3 inches deep instead of 3.5 to keep the size of the pocket true to a hedgehog. IF I were able to fit my jotters in it comfortably I would certainly use this experiment, but as it won’t fit them I’ll keep it kicking around for awhile. I’ll figure something out for it. This entry was posted in Uncategorized and tagged expanding, folder, gtd, jotter, notebooks, pocket on 20071028 by leslie. Phew it’s been a busy week here at Comfortable Shoes Studio. I’ve been crazily busy with the DayJob as well as in the studio. Yup, fresh new books. I’ve got a stack of graph paper jotters, a group of cardstock hedgehogs, a couple of kraft paper hedgehogs and a 100% cotton hedgehog all headed for etsy. I’ll post links to etsy when I get them loaded up. 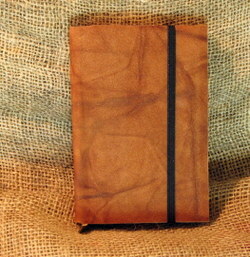 I’m pretty excited to get some leather books back up to etsy, it’s been awhile and the recycled notebooks seemed to be taking over my shop. While I was in the studio I cut several large notebook sized covers from this chunk of sleek black cowhide I’ve got, they will be fantastic with either white or red stitching…. Keep an eye out for those too. I’m going to work on designing the spines today. 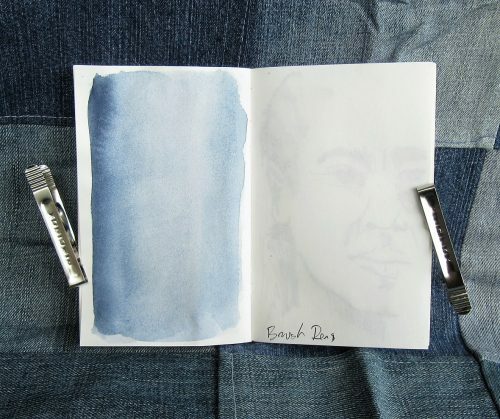 This entry was posted in Uncategorized and tagged art, book, diary, etsy, handmade, jotter, journal, moleskine., notebooks on 20071028 by leslie. wallets that I couldn’t resist. 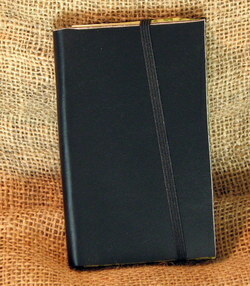 I can’t find a link to the Staples version of the 3X5 card case but trust me, it looks JUST like the Levenger case. Probably a lesser quality but still very nice. It retails for $14.99. They had a bunch of other snazzy accessories, notebooks and portfolios. All coordinated in colors and designed to look good on any desk. In bookbinding news, Staples has discontinued Wausau’s pastels paper in favor of their own line of paper. The Staples paper is also acid free BUT it only comes in at 20lb, Wausau’s paper was and is 24lb. 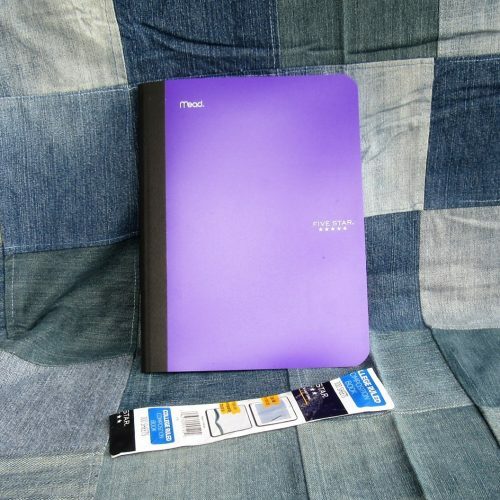 But Staples now has acid free pastel colored cardstock @ 110lb and wonderfully coverstock @ 65lb. Here’s my one issue with the I would be fine with the change if the Staples brand was in a comparable weight but its 4lbs less, which makes one hell of a difference when writing with a fountain pen.I bought a package to test out and see what it’s like but I’m not holding my breath. What I am excited about is the coverstock. I’ve been looking for a decent coverstock for age that was both cream in color and acid free most brands do not make it. Usually it’s bright white and not acid free. I would suggest that thus far the range of papers they are introducing isn’t comparable to Wausau but Hammermill and because of the acid free labeling on the Staples paper I"d say thus far they are beating them out. Have I mentioned how much I dislike change? * a quick check online shows that the Wausau paper is available online, in the colors I use (IVORY) even cheaper than I had been buying it in the stores. So I’m wondering if they are getting rid of all their stock and I’ll never find it again. 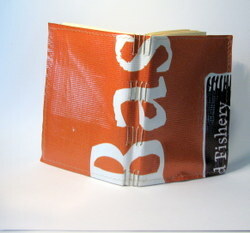 This entry was posted in Uncategorized and tagged 3x5, art, bookbinding, cards, notebooks, staples on 20071006 by leslie.